Lenovo has just launched three tablets at MWC, Barcelona; of which the 10 inch S6000 Tablet has generated a lot of interest. Going by Lenovo’s claim that it will be a center for home entertainment on a mobile device, people are definitely curious about the tab. So let’s see if we can predict the future of S6000 Tablet. very portable and comfortable as a mobile device. With a pixel resolution of 1280x800, the touchscreen is at par with other tablets in the market. What makes it different is the IPS-LCD capability for wide angles display (more than 175 degrees) and better onscreen colors. With a massive random access memory (RAM) of 2GB, the tablet ably supports multitasking and HDMI video display. The 5 Megapixel camera is not really comparable with other makes and models launched concurrently, but the other functionalities will outdo this shortcoming. The tablet is also designed for High Speed Packet Access (HSPA+) data transfer to make your video streaming a lag-free experience. The telecommunications speed supported by this technology is equivalent to broadband connections so no one can find fault with data transfer and syncing speeds. The front facing speakers are supported by Dolby Digital sound technology so the tab will be a treat for multimedia fanatics. Don’t worry about the battery! It is designed for heavy and continuous use of up to 8 hours. The tab also supports GPS tracking and Google maps. Whether you are using the tablet for work, entertainment or both, the storage capacity of 16GB will prove quite sufficient. But if you still want more, with the microSD slot, the memory can be expanded up to 64GB. This is more than sufficient for anyone’s work and multimedia needs. With 3G networks the tablet has Wi-Fi compatibility giving the users Internet access on the go. So far there are no signs of dedicated network providers but high-speed connection is definitely a part of the deal. The tablet’s predecessor, IdeaTab S2110 has similar display and functional features along with an earlier version of Android operating system. 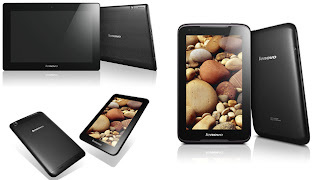 Lenovo S6000 Tablet however has very obvious upgrades in its advanced technology, especially where its high definition visual output and sound effects are concerned. Although it doesn’t appear to compete with the retina technology of some other brands, it surely has the specs and performance level to meet the market competition. Lenovo’s S6000 Tablet promises to be colorful without being garish; to have HD quality display without being too bright; to have wide angle imagery without distortion; and still be the workhorse for the unstoppable workaholic. This is a guest post brought to you by Samantha Kirk, a writer for <a "bundles.telcoservicesgroup.net". Samantha provides up to date content and information for high-speed internet, phone services, bundles and other Centurylink offers.